A painting of the final battle of a French sea captain against British forces off the Mull of Galloway is going up for auction. Such was the gallantry shown by Francois Thurot, it was said that even the British public mourned his death in February 1760. 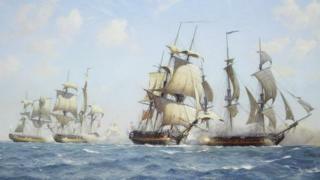 Derek Gardner's painting - Thurot's Last Fight - will go under the hammer at Bonham's Marine Sale on 24 April. The estimated price is between £20,000 and £30,000. The defeat of Thurot during a bloody 90-minute exchange off the Wigtownshire coast, followed a four-hour cat-and-mouse chase across the Irish Sea from Belfast. The final encounter ended "four years of terror" wreaked by the Frenchman on the British navy, and was seen as a pivotal moment in the Seven Years War. His body was thrown overboard during the battle and his corpse was found washed up on the Mull of Galloway, wrapped in a velvet curtain. The curtain is still at Monreith House near Port William. He was also found with his silver tobacco box - which is now owned by someone in Castle Douglas.